Survival of early humans often relied on the ability to identify plants and flowers. This evolutionary adaptation may explain the ability of individuals to remember environmental information. 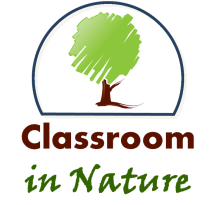 There is a strong connection between learning about nature while outdoors and the interactions between society and nature. Obviously, there are conventional ways of learning about science and the environment, but it is most important to remember that “tactile and other sensory-driven modes of inquiry are important learning pathways in primary and adolescent outdoor education programs” (Auer, 2008, p. 7). Sensory perception is actually an ancestral form of human cognition, and this form of cognition is ideally suited for outdoor environmental education. Infants first learn about the surrounding environment through their senses. The importance of an infant using senses to determine surroundings is parallel to the way early human individuals learned to survive. “Our brains developed under the pressure of natural selection to make us good foragers, which is how humans spent 99 percent of their time on Earth” (Auer, 2008, p. 7). Early humans that recognized certain plants and classified them were naturally selected to survive. By being able to recognize a flower, an individual may be the first to retrieve its fruit when ripe. While outdoors in nature, a child is more likely to “encounter opportunities for decision making that stimulate problem solving and creative thinking because outdoor spaces are often more varied and less structured than indoor spaces,” and “induce curiosity and the use of imagination” (Burdette & Whitaker, 2005, p. 48). These critical thinking skills and imagination developed as a child can lead to better critical thinking skills and imagination as an adult. Such a process could lead to critical thinking about the environment. Imagination is a vital component of child development. Access to an outdoor classroom will stimulate student brain development. This will enable students to be more imaginative and improve critical thinking in school and everyday life. All of these aspects allow children to excel at school and become better citizens (Burdette & Whitaker, 2005). Many studies have shown the possible connection between outdoor education and learning. Students that have had outdoor education curricula received higher scores on tests of knowledge transfer (Basile, 2000, p. 24), earned higher grades and scored better in math, writing, and reading (Lieberman, 1998, p. 2), and developed positive academic attitudes and established greater knowledge gain (Ratanapojnard, 2001). “Relaxed participation with adults that ensures opportunities to see and touch objects, to hear language and other sounds, and to explore the environment are best for promoting brain growth during the early years. In contrast, overstimulating babies with academic training and other lessons can impede brain development and the child’s desire to learn” (Berk, 2006, p. 188). Berk presents very valuable information about just how important it is to let children experience their physical environments, such as the outdoors. Doing so can actually promote healthy brain development. Perhaps it is this healthy brain development that promotes environmentally-conscious behaviors in the future in adulthood. It is for this reason I believe an outdoor classroom should be installed at every school. Although the school may have limited land resources and the cost for such a project is high, there are many benefits that greatly outweigh the initial costs.